Performing Resistance is a research project by Annika Lundgren, carried out with support of the Valand Academy Research Board and in collaboration with the independent cultural platform Skogen. The project concerns itself with the potential of strategies emanating from the field of art as tools for transformation, discussing the relationship between inside and outside the institution, between thinking and doing and between antagonism and cooperation. Performing Resistance consists of three co-dependent parts: a series of seminars on resistance; the Archive for Resistance Strategies to collect knowledge and ideas; and the performing of the archive material through artwork, lectures, workshops and actions, all sited in Lundgren's artistic practice. Tri-weekly study groups around the Archive for Resistance Strategies will be resumed. Seminar on Performing Resistance at Valand Academy. The third seminar took place on April 8, where participants left Valand Academy by bus towards an undisclosed location. The formal part of the seminar ended with the arrival at Skogen, where the evening was continued with bar, mingling and the performance Än mindre Hamlet (Ego Boy Going Chronos) by Yak Kallop. Performing Therapy aimed to bring about new reflections on the nature and potential of therapy as resistance, such as this has been touched upon by artists, philosophers and psychiatrists but methods have not yet been significantly developed. Art and therapy are historically linked through the concept of art therapy, understood as a creative method of expression that has been used as a therapeutic technique taking the dual roles of diagnosis and cure. From this perspective art therapy is linked both to the genre Outsider Art and to the idea of the—frequently psychologically challenged—artist genius. Contrary to this traditional function, however, therapy may be used to identify and analyze social and political hierarchies and power structures or as a method of de-programming us from the rhetorics of neo-liberalism, curing us from understanding ourselves as passive consumers, regaining our status as active citizens. Keynotes were given by Nina Möntmann, Malin Arnell, Valentina Desideri and the seminar was moderated by Annika Lundgren. From Therapeutic Power to Resistance? Therapeutic Thinking in Contemporary Art. Or Psychotherapy in the Arts. The Art of ‘Killing’: How Much Truth Comes from the Lie that Tells the Truth? The second seminar took place on November 20 where participants left Valand Academy by bus towards an undisclosed location. The formal part of the seminar ended with the arrival at Skogen, where the evening continued with bar, mingling and a performance by Yak Kallop. Resistance and the Institution posed the question of what concrete strategies of resistance can be extracted from the academic institution and how its resources can contribute to counteracting contemporary neo-liberal agendas. Razmig Keucheyan, professor in sociology at the University of Paris-Sorbonne, points out that the political and intellectual fields have grown more and more apart since the second part of the 20th century. Keucheyan also claims that new social movements such as Occupy and Indignados need mediating institutions—such as the universities—to help elaborate their ideas and to tackle the question of where to go next. To meet this demand we, who work within institutions, need to think of themselves as being in and not of the institution, to create platforms for organizing combined knowledge and to open the academy to new functions: social, solidary, and supportive. We need to locate the institution’s anti-capitalist potential and discuss the practicalities of how to put these intellectual and material resources, and use these in ways that support actions that have an actual political effect. The matter ultimately concerns not just the relationship between academicism (or art) and activism, but the very relationship between citizenship and activism. Keynotes were given by Mikkel Bolt, Kuratorisk Aktion and Yak Kallop, and the seminar was moderated by Annika Lundgren. The first seminar within the artistic research project Performing Resistance departed from the question of how artistic work undertaken inside of the institution can be combined with political commitment The seminar was held at Valand Academy, with a performance by Psychic Warfare taking place during the procession to a concluding event at cultural platform Skogen. Keynotes were given by Gregory Sholette, Andrea Phillips and Jess Baines. The seminar was moderated by Annika Lundgren. The workshop and discussion forum at Skogen was moderated by Annika Lundgren, Niklas Persson and Kanslibyrån. 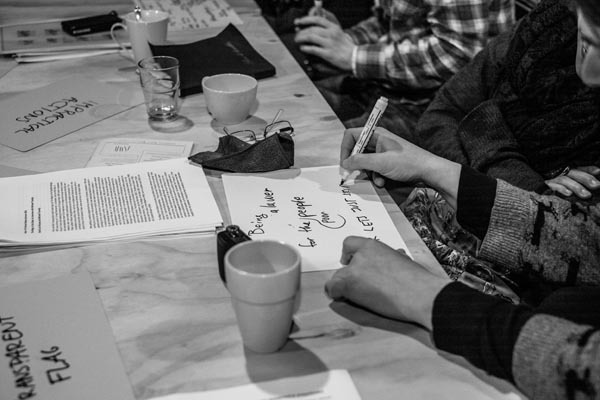 Whereas the thematic for the first seminar was an investigation of the relationships between art, activism and academicism, this workshop aimed to develop new strategies for political resistance. This was done by following a successive series of conceptual and practical exercises in which the participants of the workshop undertake worked with concepts such as the use of abandoned forms of knowledge, the populist politician as illusionist, the irrational as destabilizing element, everyday activities as rituals and the art of doing nothing in a production-focused society. The archive is a central part of the research project Performing Resistance and accommodates a continuously growing collection of strategies for political and societal transformation. Strategies are collected from various contemporary art practices and works of art theory during the seminars, workshops, study-circles and other events and activities emanating from the project. The collected material acts as a source for Lundgren's continued research and performative work, inside and outside of the art institution. You can visit the online version of the archive at resistancearchive.org or use the physical version of the archive at Skogen. Anyone is welcome to use the material in the archive and is encouraged to contribute with new strategies or additional content for already existing strategies. Send a mail to Annika.